You can answer the question on the title after reading this post and after watching the show. 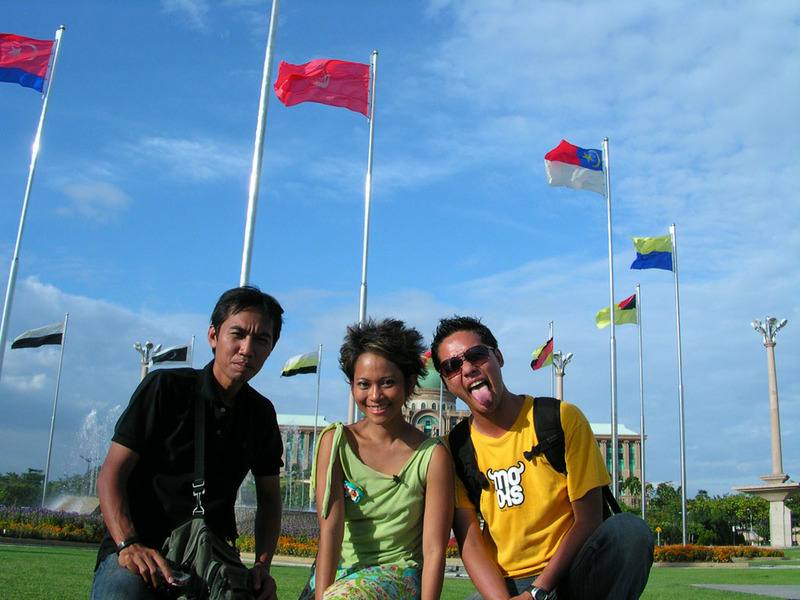 This time, the crew members — Anca (producer), Bambang Triyono (cameraman) and myself (host) – went to Malaysia to witness the opening of Floral Festival 2007, one of the programs of Visit Malaysia 2007. 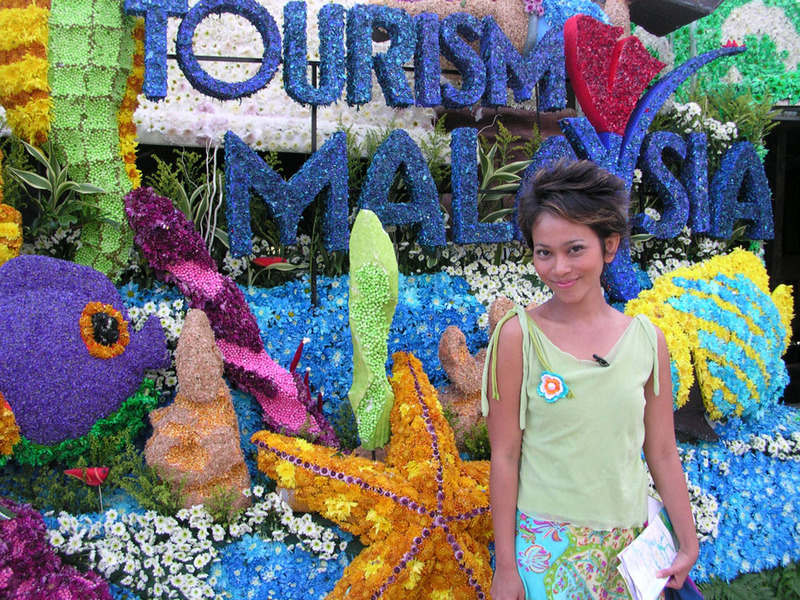 The Malaysia Tourism Board invited SCTV, two other TV stations and 7 printed media from Indonesia to go there. I was surprised to see that the government actually invited more than 190 journalists from all over the world to promote the country. Wow. 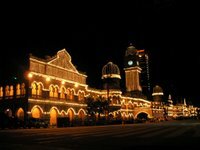 Was wondering, would my country spend that amount of budget to promote our tourism? Hmm.. I doubt it. to understand what we’ve been through during the filming. With all the hassle, as a host of a traveling program, I still had to be able to smile in front of the camera, even though I felt disappointed with the conditions there. As a team, we – producer, cameraman and host – had to think hard on angles as we had to bring the audience to see some interesting places in Malaysia, even with lots of limitations due to all the restrictions from the places, tour guide and the board. Below are some pictures and brief stories that I’d love to share with you. 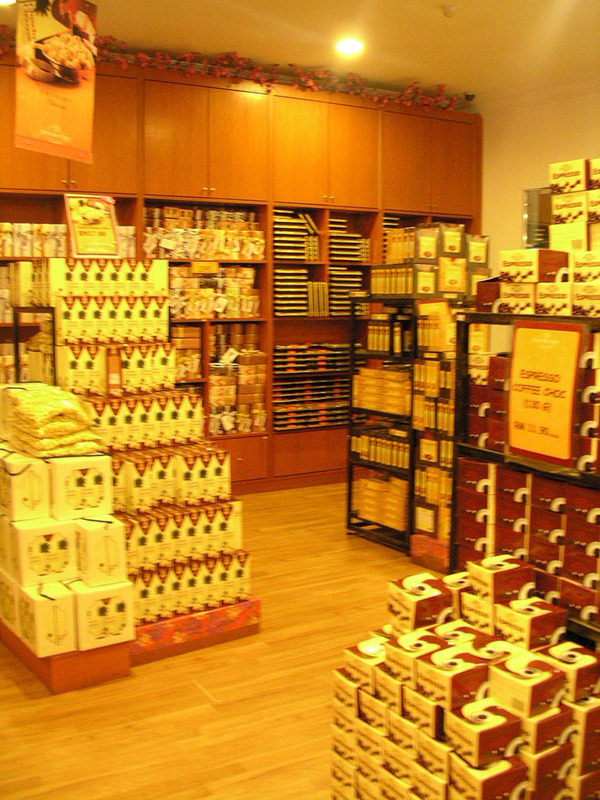 Cocoa Boutique. 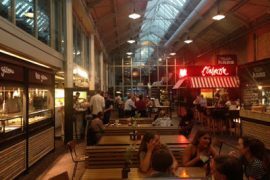 For chocolate lovers, you should come here! 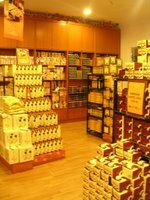 This boutique is the biggest chocolate shop in Malaysia and it has hundreds of chocolate’s varieties. My favorite is durian flavor! The best part is that you can taste all the chocolates for free. Awesome, huh?! Little India. 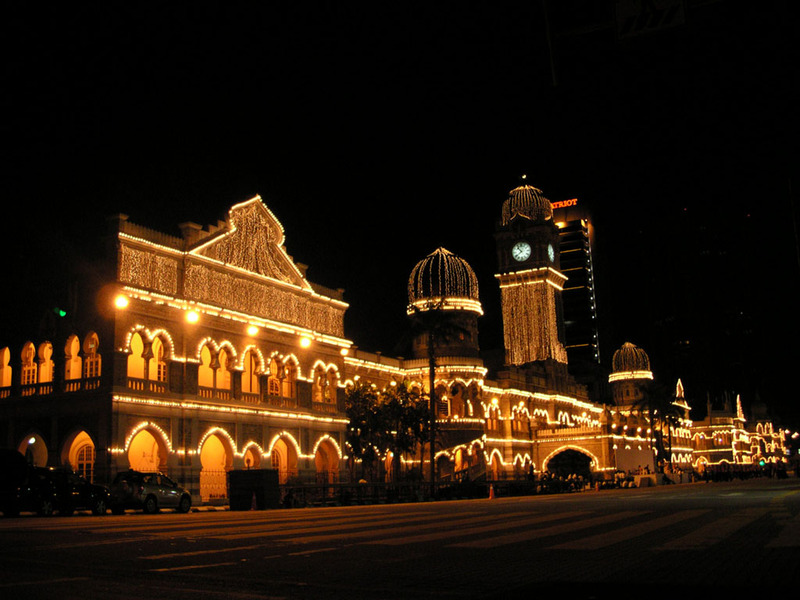 I really enjoyed myself when filming in Little India. Probably because we were all sick and tired with the restrictions for the past 3 days, we decided to do something funny and stupid. Watch the show yourself. Hopefully you’ll like it ;). 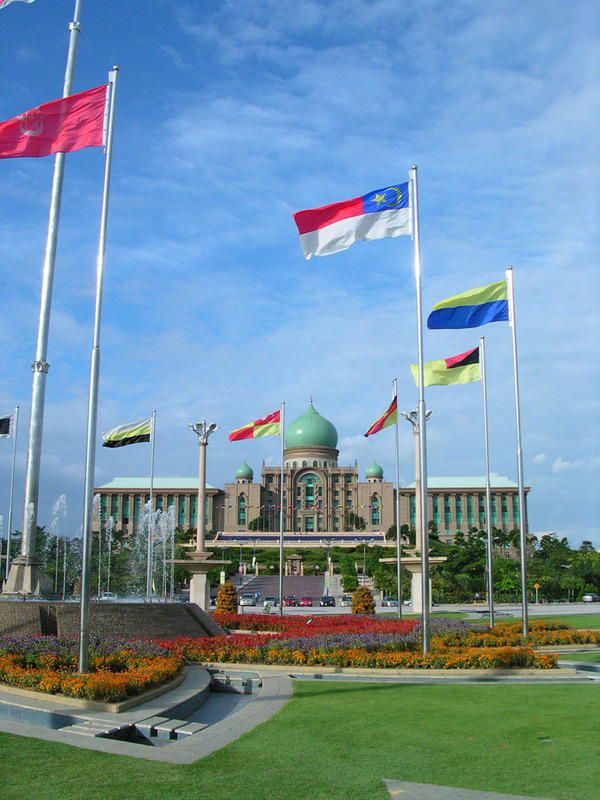 Putrajaya. It’s a central government district. The whole area is so clean and quiet. Lots of big and nice buildings, mostly built by Malaysian architects. The pink mosque is unique as it’s built on top of a lake, so the temperature inside the mosque is cool. It doesn’t even need an air con. I got a chance to take the “dondang sayang” boat ride around the lake, of course after trying to convince the PR staff that the whole purpose was to promote Malaysia (firstly they didn’t allow us to tape anything while taking the boat ride and asked for a letter from the tourism board — which we didn’t have one). Batu Caves Temple. It’s highly recommended to go there. I was stunned as soon as I got there. Seeing steep cliffs and a temple inside a cave were just amazing. There were 276 steps to get into the temple, so make sure u wear comfortable shoes/sandals! 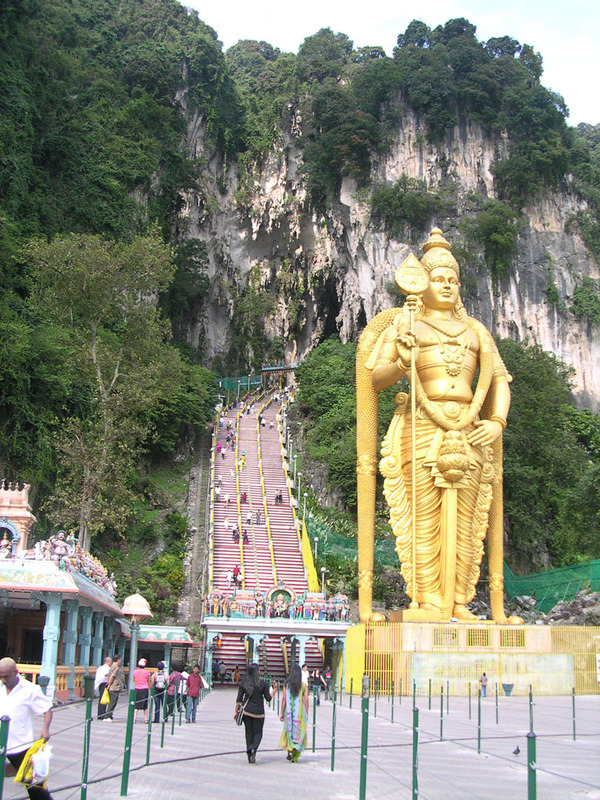 ☺ It’s really worth to go to this place, especially during the Thaipussam celebration (the first day of an Indian year). I explained more about this celebration and the temple in the show. Watch the show to get more explanation and see how beautiful the place is. Genting Highlands are also a tourist destination. It’s a fun place where we can take different rides indoor and if the weather is nice, you can take a roller coaster and other heart pumping outdoor activities as well. The temperature is pretty cold there. So, don’t forget to bring a jacket or sweater otherwise you’ll be freezing cold! Hehhee.. Oyeah, I also tried the wall-climbing here. It was so scary at first, knowing that it’s the tallest indoor wall-climbing in Southeast Asia. But, after I stepped my feet on the wall, it wasn’t that difficult. Thanks to my gym instructor who used to make my days at the gym were miserable. Hahaha! 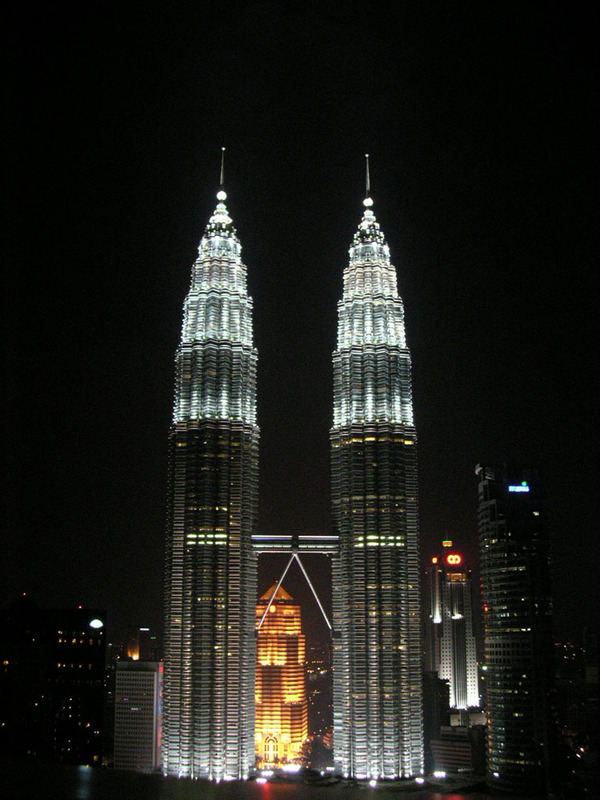 Want to see other interesting places in Kuala Lumpur? Watch “Melancong Yuk”, Malaysia episodes on Saturday, 3rd Feb and Sunday, 4th Feb at 6.30am WIB on SCTV. 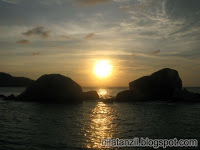 If you live abroad, you can see the shows at http://www.liputan6.com/. Ndoro Kakung… waduh.. aku tersanjung nih dikunjungi Ndoro… kita tunggu kelanjutane piye yo, Ndoro.. hehehe. i just come from ndoro kangkung b’coz a litte bit curious about u.. salam kenal. Makasih ya udah mampir2x di blog ku.. 🙂 hehehe.. salam kenal juga! 🙂 Sering2x main ke sini yaaahh..
Whehe, ini toh tulisan yang amat terkenal itu. Hehehe. Hebat teh Mbak Nila. (salah satu rangkaian) Tulisan ini mengguncang (*this blog rocks… kalo terjemahannya salah, maap, hehe*). Your problem be highlighted by The Star newpaper here today (The Star writer is Mr Wong Chun Wai thru is comment section). 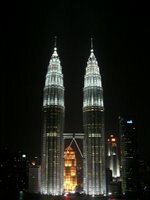 I am sad that the Malaysia Tourism Board treat you like that..what a shame n lose to Malaysia. (ngak ngetop di Indonesia gitu). The last paragraph wrote “…Someone in the ministry has to explain to Nila and certainly to Malaysias who’ve read her complaints”. Harap tidak menyesal untuk datang lagi ke Malaysia. Very sorry to read today about the poor delivery service you experienced, during your visit to Malaysia. But my friends in jakarta, told me you did a very good coverage nevertherless. Was the show on last saturday night past? Keep up the good work and blogs. Being in the service industry for over 20 years, we always treat our complainers very well the next time we are given a chance. I hope you will come again and experience the true malaysian hospitality. Blessings and every success always. Good job Nila in bringing up these issues! The incompetents can no longer hide by asking you not to contact anyone or call anyone. They shall face the consequences for their incompetence. It is sad that the mentality of these “officers” still prevails. I hope your blog will be a good slap to wake them up from their daydreams. No offense meant to anyone involved… but surely we shouldn’t tolerate anymore such errors that damages Malaysia’s reputation. 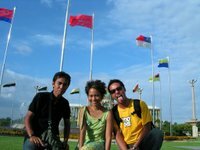 Ezuddin: I don’t regret and would love to visit your country again :). Am sure there are lots of beautiful places to see ;). There were two episodes and there were aired about a month ago already. For sure I will come again, if not for work, for holidays :). anonymous, thank you for dropping by and for your comments as well. Telat banget ya, aku baru baca tulisan yang udah rame banget diomongin ini, sekarang ini.. So sorry to hear about your bad experiences during your duty-calls in Malaysia. 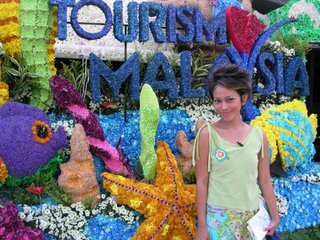 I used to work in Malaysia Tourism Promorion Board (MTPB) myself and travel to Malaysia quite often. As far as I concern, everything was good. People are nice and easy to cooperate with. I am not sure what really happened to you and your crew. You guys might be in the right place met the wrong people. nice posting 😉 keep up the good article from u ya ! ehhehe bagus mbak nila, selama pernah tinggal di malaysia 3 tahun emang banyak aturan2 yang rasanya ga penting..semangat mbak!!! hi Mbak Nila.. just want to say YOU ROCK!! salam dari temen2 jurnalis di Majalah Grey Bandung..
Kalo menurutku yang mereka lakukan sesuatu yang cukup wajar dari sudut pandang ekonomi. Mereka melihat kita sebagai pesaing dan meng-klaim diri sendiri dalam slogannya sbg Truly Asia. Kekurangan Nila bagi mereka adalah kombinasi dari Pers & Indonesia. Kalau Nila orang filipina, mungkin beda, knapa? Karena filipina tidak punya Bali, tidak punya Bunaken, tidak punya Lombok, tidak punya borobudur dan prambanan. Next time, use hidden camera! yaneh, aku juga dukung banget buat tulisan mbak nila tanzil. soale sekarang itu sudah kebalik, kalo jaman bung karno dulu orang malaysia memuji2 indonesia, entah dari pemandangan indahnya di bali maupun sdm nya yang ditempa melalui itb atau universitas lainnya. entah kenapa sekarang orang indonesia pada berkiblat ke malaysia. apakah benar jika di benchmark indonesia kalah dengan malaysia untuk segala bidang? aku nggak yakin. emang malaysia selalu rese sama kita. Liat saja kasus ambalat. Pesawat ama kapal perang-nya cuman berani “gertak” TNI-AL. di kejar malah kabur…Wah coba sekali” mereka adu di Laut atau Adu di dalam hutan kalimantan, Kira” sapa yach yg menang? Liat aja mahasiswa-nya di Yogya, bahkan pernah ada kasus di kostku,mereka mabuk dan buat keributan di kostku. Kebetulan di kost-ku banyak Anak Makassar..di kejarlah mereka pake parang dan lari terbirit-birit. padahal badan mereka gede”.kekeke.dasar penakut,cuman tau bikin ribut…lempar batu sembunyi tangan…! Biarin aja tu Menteri Parawisita Malaysia berceloteh…emang Ndeso,Kutukupret,Katro…Sana Kembali ke Hutann..
salam kenal & i’ll support u sis…. a friend of mine who has been working in Malaysia for quite long time now said it is because you are Indon. It would be very different if someone else (from other nationalities) wrote it. To the minister, i think he saw you as: “indon-woman-critics”. Combine with his absence of intellegence, we got: shallow stupid comment. To us, you are journalist-smart-honest. Keep on writing! this story is just one side view. M not Malay or Indon, but I travel to M’sia quite a lot since 1992. so can tell you. another issue; pls, don’t talk negatively to Tourism Minister. he is current minister for tourism m’sia and we have to respct him anyway. in my point of view, Nila had a bad experience but senior MT officer is not a stupid as did treat like that. Perhaps with other reason or too sensitive complain by Nila. Kenapa si-Menteri nyebut Indonesian jadi Indon, bukankah itu sebutan yang biasanya untuk TKI (kesannya merendahkan) ? saya mampir kesini karena posting di http://sambeltempe.blogspot.com — dan baru ‘ngeh’ persoalannya. jangan khawatir, nila. jaman sudah berubah. salam kenal, y.
Hi! You have a good blog. Wish you all the best and keep up the good work. Hope to be you blogger friend. 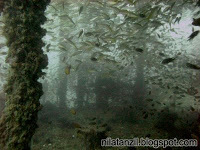 Please spend your little time to see my blog. 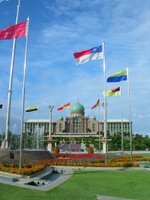 Information about Visit Malaysia (Tahun Melawat Malaysia 2007): Interesting places and activities, Foods and beverages, hotel bookings and reservation, women and men, latest and issues, Malaysia map, Merdeka 50 tahun blog, negarakuku song by namewee, backpackers heaven, pictures and more.